Today on the subway I watched a gigantic homeless man, who actually wore an actual cardboard sign around his neck, stagger up the train car shaking his cup and hollering “spare change.” This happens all the time, but this time, when he got about halfway up the train he stopped. There were about thirty grade-school kids all wearing blue shirts — a summer camp on a field trip. They were laughing and playing patty-cake. The homeless man stopped, turned around, and hustled to the other end of the car with his back to the kids, and his head down. He exited at the next stop. It was totally heartbreaking. The gimick? The SYSK folks were competing against everyone with an all-star trivia team that included Christopher McCulloch (creater of the Venture Brothers) Joe Randazzo (editor of The Onion) Wyatt Cenac, Ira Glass, and John Hodgman! We sat one table over from the superstars. 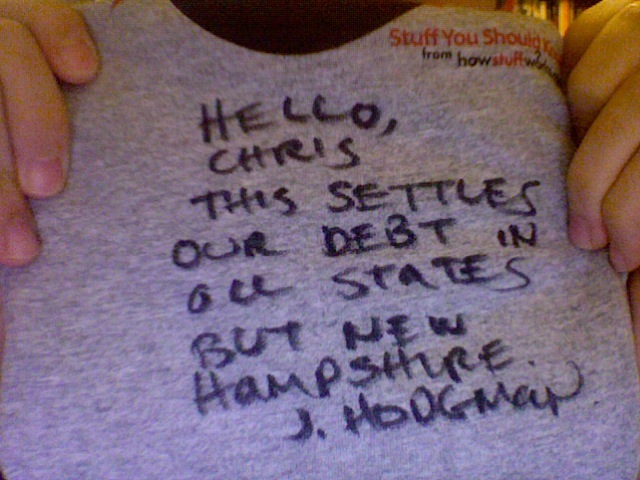 I got a free shirt, and J. Hodgman was kind enough to sign it. I mentioned that I’d written a (fairly favorable) review of his latest book, and he asked if he owed me anything. 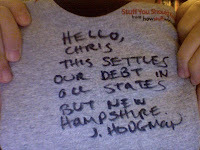 Thus the shirt-note. Who won? Our team didn’t, but neither did the superstars. The table behind us, named “Choad the Wet Sprocket” cleaned everyone’s clocks. Lately I’ve wanted to walk. Down from Park Slope past the cemetery into Sunset Park or further into Bay Ridge’s Chinatown, or north up to Williamsburg. Across the park to the east or over the bridge and up into midtown. I’d walk to the Bronx if I could. To Yonkers. With this much city there’s always more to see, and even on my daily treks (to the laundromat, the hardware store, to get groceries) everything is always changing. But I fall in love with the city when I’m in a cab. With the windows rolled down, zooming over the bridge or along the water, at night, staring at the lights on the buildings, I feel like the whole city is min, mine to watch and wonder at. Last night K & her work friends decided to go out: a beer garden in Gowanus then the Bell House to meet up with more friends. Katie came in a car and wanted to keep drinking so when we decided to find a karaoke bar in Bay Ridge, and when it turned out no one else could drive Katie’s stick-shift Acura, she handed me the keys. 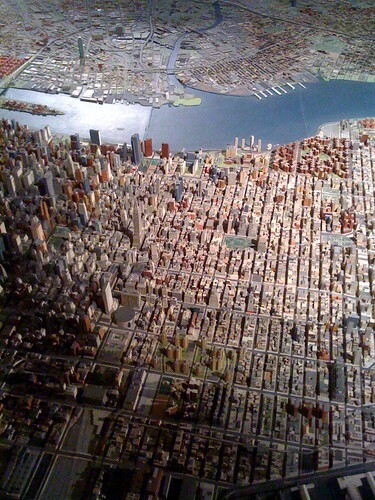 We shot down Fourth ave., which I love, because the lights are timed: 14th street, 23rd, 34th, 44th, 62nd. Then a hard left up to 8th ave. and a perfect first-shot parallel park into the last open space. Driving in the city can make me fill like a God. Being driven around can make me feel like an emperor. But at the end of the night, after the drinking and singing, when we all decided to take cabs home, I walked out to 8th and stared north as far as I could up the avenue. Forty-eight blocks north and two blocks west was my apartment. What would it be like to walk? What would I see at two, or three, or four in the morning? It pleases me to feel like a God, to be treated like a king. But walking — walking makes me feel like a traveller, like a citizen. 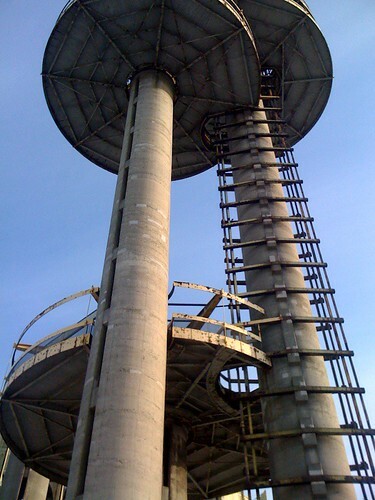 Walking takes me into New York like a seed in the loam of the city. 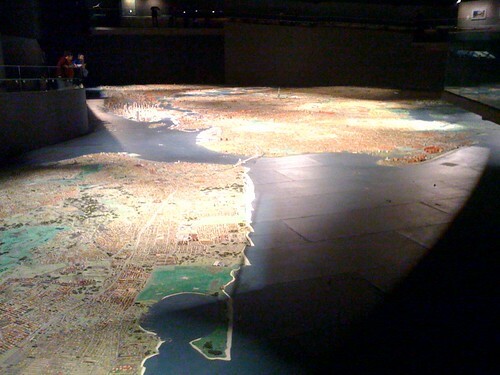 "But fundamentally, The New Yorker is something you want to sit with and not be distracted by. I don’t mean this in a spiritual way, but it’s a meditative experience. The Web is fundamentally a distracted experience." I haven't tried to read anything on a Kindle. I've played with an Ipad (no, I won't capitalize it that stupid way) for about fifteen minutes in the store — enough to flip several pages on Winnie The Pooh, play a video game, and watch a short video. I also subscribe to paper editions of The New Yorker and Harper’s magazines (which I don’t read on line) as well as New York Magazine, The New York Review of Books, and The Believer (which I do). I write for The Brooklyn Rail and often advertise my articles on the web, but when I read it, I read it in paper format. And only once in my life have I tried to read a book on my computer. It's called The Story of Don Miff and, though you can now buy a print-on-demand copy on Amazon, at the time it was unavailable anywhere. I made it roughly 1/3 of the way through, on my laptop, before I gave up. Blake Eskin and this ad both make a pretty good point — and it’s a point that, as far as I can tell, the Ipad, with its games and movies, doesn’t address. And that is that reading a book or a magazine is, in many ways, a very different experience than reading online. When I get my new copy of the NYRB, or New Yorker, in the mail, I will often read it cover-to-cover before the next issue arrives. Sometimes I zip through it, and sometimes it sits around for several days. Sometimes I get busy and don’t read it all the way through, but when I do, there’s a sense of satisfaction, of having really read the magazine. I don’t do that with Slate, or with AV Club, or any of the other online magazines. I don’t think I even could, and I honestly don’t know what that would look like. The problem, for me, is two-fold. One is that the online editions of most magazines, with their archives, and blogs, and endless updates, are more or less impossible to fully read. The profusion of information is the point of on-line media. The other is that most online magazines now include profusions of hyperlinks (much like this post) and even if they didn’t, they often discuss subjects that I don’t know much about, and the temptation for me to launch off on a quest of, say, the history of the Knights Templar, or who built the Brooklyn Bridge is irresistible. I don’t know much about the Kindle. I don’t know its browsing capabilities, or whether you can play video games on it. But if you can’t — if it’s just trying to be a book — that might be a good thing. That might, oddly, become its advantage over the Ipad. People will probably, at least at first, buy a lot of books (among other things) on the Ipad. But if trying to read on it is anything like trying to read on a laptop, then they might not get through very many of those books. And they might stop buying books so much, favoring instead more distraction-friendly activities. Because, honestly, this post is only 650 words long, and how many times have you already clicked away, following links? How would it be if you were trying to read a 50,000 word novel? Ever since I read Matthew Crawford’s book on the value of physical (vs theoretical) work — especially repair work — I’ve looked for opportunities to fix things. 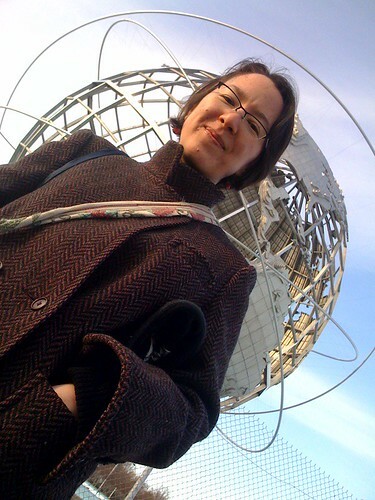 My wife and I rent, and since we moved to NYC and gave up the car, most of the stuff we own is not all that complicated, or hard to figure out (not that I could figure out a car anyhow. Those things are complicated!). So what to do? I poked around a bit when one of the range igniters on our stove got disconnected, and I spent some time reattaching one of the window balances in our bedroom, when the window wouldn’t stay up. But otherwise, there’s nothing much in the house that fits that sweet spot of being both fixable, and not so overly complicated that I couldn’t/shouldn’t touch it (when the gas line stopped working to one of the stove’s ranges, I just called the super and he fixed it). Vacuum cleaners are interesting machines. They aren’t complicated at all — they’re basically just a motor attached to some tubes that draws air in and deposits it (and the dirt) into a bag or plastic container. They aren’t yet (the ones I have access to anyway) overly computerized, but when they break most people still just chuck them out and get new ones. This means that I wasn’t surprised the other day to find a relatively new-looking hand vacuum sitting outside someone’s apartment, in the free-if-you-want-it zone between fence and curb. What’s most fun about opening up a broken machine is you never really know what’s gone wrong, or how to fix it. So (at the behest of friends and spouse) after carefully inspecting this little street-find for bedbugs and other unwanted critters, I went ahead and took it home and opened it up. At first, the problem seemed to be pretty simple: when I turned it on, the brush wouldn’t roll, and the belt that turned the brush was missing. I went to the store and bought a package of two new belts (cost: $6) and some new bags for good measure, and came home. But when I put the belt in, I noticed that it still wasn’t spinning, and I was smelling a burning rubber smell, as well. Uh oh. So I went back and pulled the whole thing as apart as I could get it. Then I started fiddling around. I got it mostly apart, and (with it unplugged, of course!) put my fingers in the rotor and started trying to spin it. Sure enough, it was stuck. I felt around, and found something rubber that seemed loose. A few seconds later, out popped the old belt, which had gotten sucked up in the motor’s fan when it broke. Voilà! I put it all back together, put on the bag, and swept up the carpet. Okay, but so I fixed a little vacuum cleaner, so what? Well, Crawford would say that I spent a little time engaged in my environment, not as its master (or more rudely as the helpless baby that demands all objects serve me) but as its servant — understanding the “needs” of the machine, and bending my own will to solve its problems. Through this, I’m able to develop some humility and also be a more useful part of my environment. That’s all fine and good, but mostly I like the feeling of success — a real, solid I-made-something-right kind of success. The kind that people might only get close to when solving video game puzzles anymore. Plus, I got a working vacuum cleaner for $6. Nice! Everyone needs both Serious Literature and Trash. Confucius said that. Or Sarah Bernhart. I’m not sure. But it was said, and it was true. Lately, I’ve been drowning myself in a sea of serious literature, and I kind of forgot to read any real trash... so earlier this past weekend, when my neighborhood started playing a new season of its favorite fairweather game, Leave A Big Box of Books By Your Front Door for People to Take, I grabbed Neal Stephenson’s Quicksilver — a monstrous brick of 17/18th c. steampunk (or maybe coalpunk?) that is, apparently, only the first in a trilogy. It’s absolutely awful. It’s mostly written in modern English, but Stephenson keeps throwing in the occasional olde spellinge: “phant’sy” to let us know it’s that time period, and then quickly follows it with an anachronism (“he’ll have to ‘get in line’ as they say in New Amster- I mean New York”) to let us know that it’s not our version of that time period. But I love it. I’m hardly 60 of the 900+ pages in so far, and I don’t want to stop reading. It’s ambitious as hell, lovely and crazy, and weird, and not at all careful about what it’s doing. It reminds me of the best and worst of Orson Scott Card, or Douglas Adams — the ride is wild and that’s the only point. Awesome. Wonderful! It reads like one of those lists of topics “discussed” in the Believer magazine, only gone terribly, terribly awry. My heart skips a beat hoping that all of these things will show up in this endless, crazy, book. I’ll let you know. Which leads me to an overwhelming question: where is trash poetry? I’m not talking about pretentious crap, or amateur high school bloodletting. I mean where’s the lowbrow poetry, the poetry that’s not aiming for readers somewhere on the far horizon of time? Where’s the modern version of the great, terrible, popular murder ballads and limericks and, heck, I don’t know, the sci-fi poems? The vampire/werewolf/romance love poems? The superhero poems? I think poemtry is suffering — has been suffering — from a decidedly over-literaturization of itself. Or, more likely, I think I just don’t know where all that stuff is, because my local bookstore is a little bit pretentious, and Amazon doesn’t care enough about poetry to separate it into subgenres. But I do know this: I’ve been reading a lot of really great poetry for a while now, and my brain is full. I think I need some enjoyable trash poetry to read. I think I’d find that pretty refreshing. So if you know where any is, send it my way.